At H-SC since 1981. He and his wife Cindy have three children: Amy, Sharon, and Jeremy. Amy is a graduate of the University of the South. Sharon is a graduate of Roanoke College. Jeremy is a senior at Geneva College. Abstract algebra, computer science, geometry, and number theory. Currently engaged in developing the mathematics curriculum to incorporate the use of the computer as a tool to aid in problem solving. 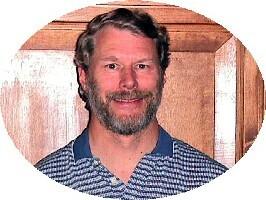 Enjoys hiking, backpacking, camping, and canoeing, as well as orienteering and astronomy. Recently built a log cabin in the mountains in Nelson County. He enjoys learning German. Copyright 1997 by Hampden-Sydney College. All rights reserved.